This Pioneer PDP-R06G media receiver was given to me by a friend to fix after another bright spark bridged the fuse that had blown on the PCB and started it cooking at R31. 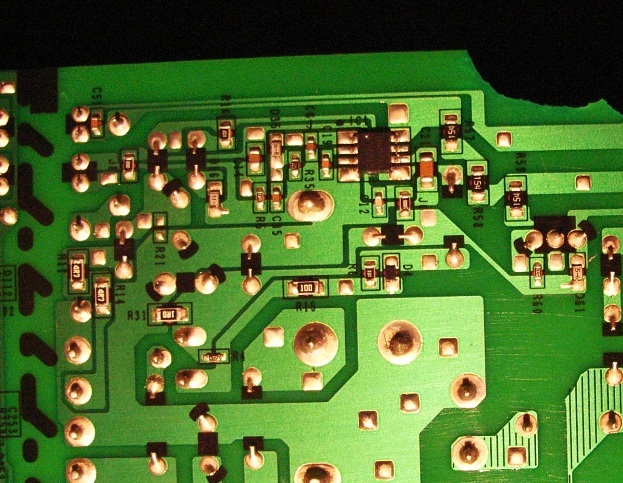 The below post hires image on underside of PCB has at least told me the value of R31 which the schematic does not so that was a help thanks very much. I found the post below in google so joined the forum to checkout the images and schematic on other post. Have a new project: A Pioneer PDP-R06G Media recieiver that someone else ‘had a go at’ before passing it onto me. Trouble I have is a triangular part of the power supply circuit board is missing!! I cannot find a circuit diagram on the net apart from a high level service manual. I cannot even find a photo of the reverse side of this board on the net. So…I know it’s a long shot, but does anyone have one of these media receivers lying around (or a similar model) and can photo the reverse side of this board? Or can anyone hazard a guess as to how these circuit paths go? The Pioneer PDP-506HD looks as sleek and high-tech as any plasma on the market, with a thick, glossy-black frame surrounding the screen. The screen itself is also quite dark when turned off, so if you mount it on the wall, it will look like a large dark monolith. When table-mounted, on the other hand, the set gives you a two-tone look, thanks to the included silver stand. The panel itself measures 122.4cm by 9.1cm by 71.9cm (WDH) without speakers and stand. Pioneer includes matching detachable speakers (pictured) with the PDP-506HD, but the most notable addition to the standard plasma package is the separate media receiver. This component-size silver box (42cm by 30cm by 9.1cm, WDH) houses all of the connections as well as the plasma’s tuners. The idea is that you connect your gear to the media receiver, then you have to run only one cable — a proprietary, 3-meter digital A/V/control umbilical — into the back of the panel itself, though the media box and the TV still require their respective AC cables. Longer umbilicals are available for installations that need them. The remote is the familiar Pioneer design that hasn’t changed in several years, and thankfully, it is fully backlit for use in darkened environments. Despite the numerous buttons, we found the large, rectangular unit well laid out. The keys are grouped in such a way that your thumb can reach the most important keys (Menu, Volume, Channel) easily. The remote is universal and capable of controlling a wide variety of other A/V components. For the most part, Pioneer’s onscreen user interface is equally well thought out, although we were annoyed that we had to go into the menu system to enable the HDMI connections. In our view,?HDMI?should be engaged by default. The feature package of the Pioneer PDP-506HD is pretty impressive, but we’ll start with the basics. This panel has a native resolution of 1,280×768 pixels, which is plenty to resolve all of the detail of 720p HDTV sources. All sources, including high-def, computers, DVD and standard TV are scaled to fit those pixels. Most other 50-inch plasmas have resolutions of 1,366×768, but in our tests, we didn’t miss the extra few pixels. It offers a generous selection of aspect-ratio options — five with standard-def sources and four with high-def. There are several colour-temperature settings available, with Warm being the closest to the broadcast-standard colour temperature of 6,500 Kelvin. There’s a User picture mode that lets you change controls such as contrast and brightness to optimise the picture for various sources, and you can save different settings for each input. There are also three adjustable global modes that apply to all inputs, as well as a Dynamic mode that has fixed presets. We found that the CTI (Color Transient Improvement) feature is exactly the opposite of its name — it reduces colour resolution and should be turned off for all inputs and sources. The?connectivity?on the Pioneer PDP-506HD’s media receiver is comprehensive, but unfortunately, many of the input slots give you a choice between two input types, rendering the one you don’t choose inoperative. Inputs slots 1 and 3, for example, give you the choice of either component video or HDMI. Granted, you can have both connection types associated with one slot, but you have to delve into the menu and disable HDMI to allow component video to function — an inconvenient solution at best. We suspect most installations will choose either component or HDMI for these inputs. Input slot 2 offers either S-Video or composite-video, while slot 4 refers to the front panel of the A/V controller, offering a choice of component, S-Video, composite or a 15-pin VGA input for a PC. There are also two RF antenna inputs, as well as two FireWire ports. A set of monitor A/V outputs with composite video round out the connection options. As we mentioned above, a proprietary umbilical cable connects the media receiver to the panel. The Pioneer PDP-506HD is an excellent performer in just about every regard. Specifically, Pioneer has dramatically improved the black-level performance over last year’s models, such as the?PDP-505HD. Now blacks are deep, rich, and inky instead of muddy grey. Shadow detail was exceptional, and the blacks are also blissfully free of most false-contouring artifacts and low-level noise. Chapters 2 and 3 of?Revenge of the Sith?have myriad space shots and dark material and the Pioneer revealed clean, deep, rich-looking blacks in these sections. Colour was fairly accurate on the Pioneer PDP-506HD . The primary colours of red and blue are much more accurate than most plasma panels on the market, but green is way off, which is typical of most panels. The Pioneer does exhibit a slight red push, which means you have to back the colour down somewhat and sacrifice a little saturation. Colour temperature was very good both before and after calibration. Turning back to DVD, chapters 6, 7, 8, and 9 of the superb Superbit version of?The Fifth Element?DVD looked spectacular, exhibiting great detail, solid overall colour saturation, and natural-looking skin tones. There was a tiny bit of visible low-level noise in some scenes, but it was not enough to be objectionable. HD content looked exceptional. The PDP-506HD did pass all the resolution in a 720p multiburst pattern at the HDMI input but cut off a small amount of the horizontal resolution on the component input. 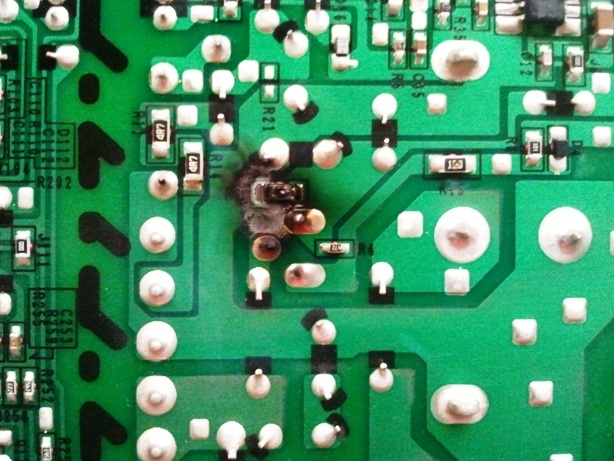 This entry was posted in Blog, Electronic Repairs by 43AX05. Bookmark the permalink.